Our Professional 3-in-1 Open Source Filament 3D Printer. 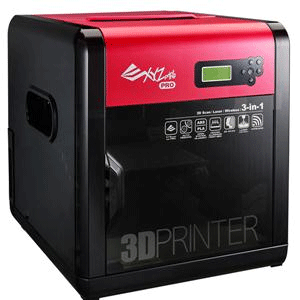 With a built-in scanner, optional laser engraving add-on capability, and an open source filament system that allows you to print in third-party ABS and PLA 1.75mm filaments, the da Vinci Pro 3-in-1 is the perfect machine for becoming your own manufacturer. The da Vinci Pro 3-in-1 is made for those seeking high-end 3D printing performance. It has fully adjustable heating, speed, and retraction settings and it is equipped with an aluminum print bed for decreased chances of warpage. Scan Resolution (Diameter x H): 3 x 3 cm - 15 x 15 cm/1.18 x 1.18"- 5.9 x 5.9"
Laser Wavelength: 350mW ± 10?